Tap into nature. Refuel with the delicious sweetness of maple syrup. Maple syrup is a natural source of potassium, manganese, zinc and more, electrolytes and micronutrients that help your body recover faster. Tap into your full potential. 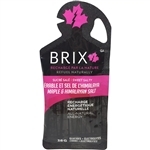 Refuel with the delicious sweetness of maple syrup blended with mineral rich Himalayan salt. Tap into nature. Refuel with the delicious sweetness of maple syrup. Maple syrup is a natural source of potassium, manganese, zinc and more, electrolytes and micronutrients that help your body recover faster. With resealable cap. 80g.